Crop with a heavy lean may require some trial and error to test the best angle of attack. Some operators will prefer going perpendicular to the lean; some will prefer going into the lean. With straight cutting, you can go whatever direction works best for crop flow. Leaving canola to ripen naturally can work well for straight combining and it saves the extra pass and cost of pre-harvest applications. 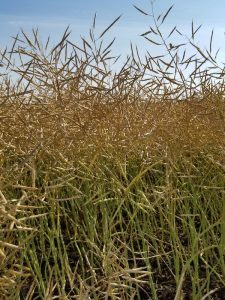 But canola left to ripen naturally will have somewhat tougher and greener plant material than a swathed crop would, even when seeds are cured and ready to combine. 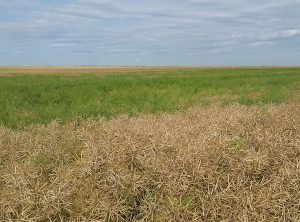 Straight-combining canola can be made easier with a pre-harvest herbicide. Here are the options: glyphosate, Heat LQ/glyphosate and Reglone (diquat). Here are factors that create the ideal situation for straight combining canola…. 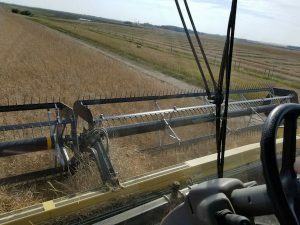 Late swathing or straight combining? 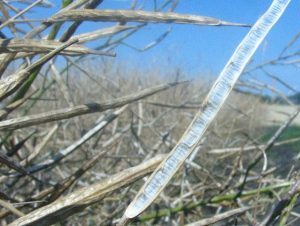 If canola is to be swathed later than optimal (with earliest pods shattering), cut in moist conditions (rain or heavy dew) to limit shattering as much as possible.